Do you make your own spaghetti sauce? I do and I follow a recipe that was my mom’s. Now. My mom was English without a drop of Italian blood to her name. Nevertheless, she made damn fine spaghetti sauce. Authentically Italian? Of course not. But truly delicious? You know it. When I was newly married I told my mom I wanted to make sauce and I wanted her recipe. There was a long pause on the phone and she finally said, “I don’t have a recipe.” I thought she was being secretive and didn’t want to share but what she really meant was that she didn’t have a written recipe because, like most good cooks, it was all stored in her head. We made a plan that I would go and watch the next time she made sauce and that’s what I did. I wrote everything, and I mean everything, down, from the type of hamburger she bought to the brand of tomatoes she used. Of course she didn’t actually measure any of the seasonings but she guesstimated for me and I wrote down those amounts for the garlic, basil, oregano and parsley. In the end, I cobbled together a pretty good recipe for my mom’s sauce. That was almost 25 years ago and I’ve been making it ever since. Of course, my written notes are long gone and now I have it all stored in my head. I got to thinking, though, that Hannah might want to make her nana’s (and her mom’s) sauce one day so I decided a blog post was in order. Plus, I had a picture of the big vat of sauce I made that I wanted to show you. Ahhh, a blog post is born. The ratio of ingredients is 1 lb burger, 1 onion, 1 pepper, 8 oz mushrooms, a 29 oz can of tomato sauce and a 29 oz can of tomato puree, plus garlic (preferably fresh), basil, oregano and parsley. The technique is simple: saute the vegetables and garlic in one pan and the meat (with plenty of salt and pepper) in another, mix them together and add in the other spices and the cans of tomato sauce and tomato puree. I usually add a can of tomato paste and a bit of sugar, too. Now, you can make a small batch for one meal but honestly, if you’re going to go to all the trouble to make homemade sauce you might as well make a big pot and that’s just what I did last Sunday. I like to let the sauce sit for a day so we had spaghetti on Monday night. I shared some with my father-in-law and then froze 12 additional bags of sauce for us to eat over the coming months. And you know that I will think of my mom every time I pull one of those bags out of the freezer. That sounds like a great way to spend a Sunday afternoon. I did a lot of canning during CSA season, but my good pot for canning is in the basement freezer holding everything needed to make a turkey soup. Maybe I’ll pull that out for the Super Bowl and finally finish that soup up, so I can reclaim the pot. I’ve never been successful with homemade sauce. Maybe I’ll dive in and give it a try! The only jar sauce we really really love we get from a local restaurant who sells the sauce at our farmer’s market. You let it sit for the day in the fridge, right? Thanks for the recipe, I must admit I use a lot of Prego. (lazy me)..but I will definitely try this soon. Thank you for sharing this story. What a nice way to begin a day! Your sauce looks delicious. I’m also a fan of fixing a huge pot of sauce, soup, chili, you name it and then freezing it. It’s so nice to have those homemade meals ready when your dinner-making gumption isn’t! Yummmm and truly such a nice way to remember your Mom. Great recipe, classic and easy, too! Your mom’s recipe is much like my mom’s. A big bowl of spaghetti with meatballs, and this sauce, would be heaven! Try substituting your Richard’s Famous Garlic Salt for the fresh garlic. It’s quicker, easier and very tasty. It’s what I use in my sauce! Add to taste depending on the amount of sauce. My mom is also not Italian but makes a great spaghetti sauce. At some point in my childhood it became our tradition to eat that on December 23rd before we open our immediate family gifts (she got tired of us being last and us kids cranky from too many presents and sugar). She even made it for a bunch of my college friends when she visited me once. Your mom’s recipe is quite similar. I am also guilty of the ‘no recipe’ thing, for spaghetti sauce, chili and probably a couple other things. Nothing like knowing you have some long simmered goodness in frozen storage. Plus, it really makes that lasagna come together in a flash. Thanks for sharing that. I have always been in love with my mom’s sauce — nothing like it! — and she always told me she just had the recipe in her head. I told her this year that the ONLY thing I wanted from her for Christmas was for her to make her sauce and write down EXACTLY what she did. She granted my wish, and I made a batch myself recently to test the recipe, and it was a perfect reproduction. I was thrilled! Though my mom is in good health and I expect her to live for many more long sauce-making years, I feel a great peace of mind knowing that her sauce recipe is now preserved! What is it about sauce that makes it seem like so much more than just food? What, no wine or sherry, no parmesan? One of my students from an Italian family in Gloucester once told me that her mother cooks a peeled potato in the sauce to take away that acidic taste without using sugar. Does it work? I don’t know! How much of the spices? How long do you cook it? That sounds so good. It makes me want to eat spaghetti tonight but sadly I don’t have a big pot of sauce made already. I’ll have to settle for store bought. I never thought about freezing the sauce in bags. I never made big batches because I didn’t want to take the time to can the leftovers. What a GREAT idea!! My grandmother from Italy had a similar recipe. She just added wine to that and whatever leftover meat they had from the week and put it in there. There is nothing like the smell of sauce in the house. Yum! Your sauce is much like my winter version, sometimes with sausage added. In the summer, the garden dictates. I generally use zucchini and/ or eggplant , often vegetarian. Always good and always a big pot full! Your pot is filled right to the brim! My best Italian recipes are from an aunt whose heritage is definitely French. Mmmm. Thanks for the story & recipe. Years ago, I remember reading a storybook about a young girl who wanted her nana’s recipe for her special cake The grandmother refused her several times before admitting that a) it wasn’t written down and b) she (nana) couldn’t write it as she could neither read nor write. So nana & her granddaughter worked together with the girl watching, measuring, & recording what her nana did when she made the cake. They were stumped about figring out the molasses as nana normally “just poured until it was right”. They hit on measuring out a known quantity and having nana pour from that container. If memory serves, the story ended with nana teaching the girl more baking and the girl teaching reading & writing to her nana. Hadn’t thought of that story for decades. Thank you for bringing it back to mind. Mmmmmmm-mmmmmm! Thanks for that great post. I learned to make my spaghetti sauce from a meats cookbook I got as a wedding present. We used it for years and it is delicious, but I haven’t referred to the recipe for years. It is always better the next day, though, no doubt about it. As you know, my Mom makes a dynamite sauce, but when I married the Italian, he had his own ideas of what makes a great sauce. So he made it one day, and we shared some with my folks. My Dad wrote down the recipe and strove to make it even better. After much practice, my Dad now makes an hour-long, small pot regularly that is a variation of Tony’s recipe, and they no longer make my Mom’s day-long, cheesecloth requiring, huge pot, stirring, stirring, stirring, sauce. And it’s great! Funny how things change. Although I LOVE to cook, I come from a long line of . . . Not Good Cooks. 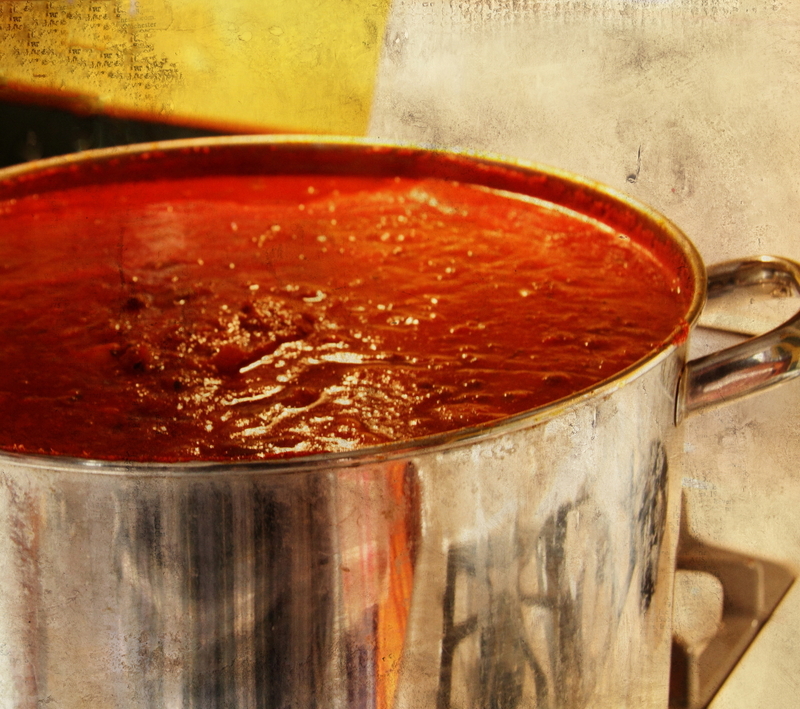 I’ve always envied stories like yours — where cooking up a big pot of spaghetti sauce brings sustenance AND memories! Thanks for sharing your recipe and your memories. I love that moment where you ask someone for a recipe and they just…don’t have one. This year I finally cobbled together a recipe for latkes because a friend of mine had begged me for one, but I still had to have her over for a latke lesson. My boyfriend’s mom is worse. She’s Thai and the food she cooks is out of this world, but a lot of the recipes are things that are things that were standard for her growing up (like the way pot roast or meat loaf might be standard for us?) and she just adapts what’s in her head to the products she can get from American grocery stores. Every time we visit I’m in the kitchen with her, frantically writing everything down! That looks so damn good Carole! I have a few recipes handed down (hand written on index cards and the like) and then those recipes that have no measurements – love them. I think we are going to be eating some spaghetti very soon … like tomorrow night (you know after the sauce sits and all)! Thank you for sharing! I live in Holland and have been turned on to your blog by a friend there in the states! Can’t wait to make your sauce!